This has to be possibly one of my favourite prompts for a photo challenge. I usually end up with tons of pictures if I struggle with one of the themes, but to be honest with ‘Lifestyle’ I ended up with lots of great pictures to choose from simply because this is the area of photography which I really enjoy. In my day to day life, I’m not a big fan of pointing my camera at a contrived scene and asking everyone to smile… of course it serves a purpose and can create some lovely images. However, time and time again, the resulting shots that appeal to me the most, are those that others might immediately reject…. where my nephew in a group portrait bursts into laughter, another where a friend is smartening up her child readying them for a picture… you get my drift. 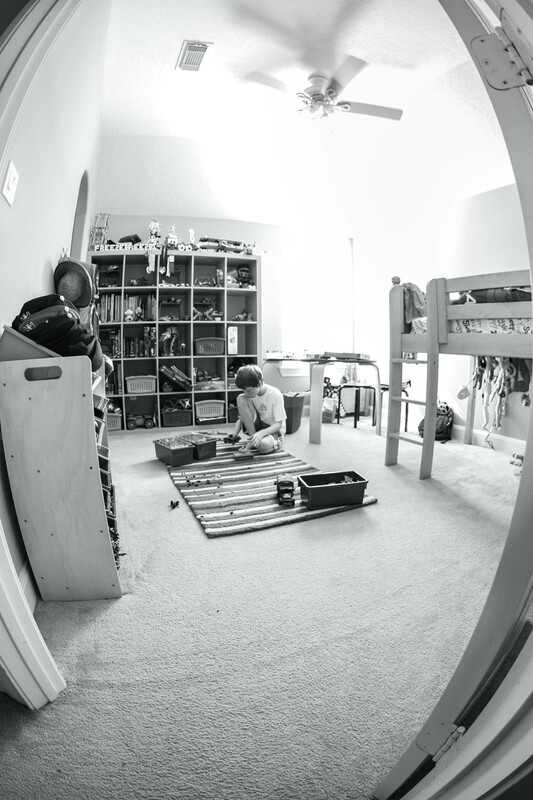 So the true essence and joy to me of photography is capturing the real, everyday moments that a family enjoys, just like this picture of my son Will in his bedroom this morning. He is used to me saying, “just ignore me and carry on with what you’re doing”, surrounded by various collections (yes he’s a natural collector/hoarder like his mother!) which include the inevitable Legos, baseball caps, and the hanging monkeys under his bed. I took this image at around 10:30 in the morning with the sun streaming in through Will’s bedroom window, hence the blown out highlights in the corner. I used my Canon 7D paired with my Sigma 10mm EX DC HSM f/2.8 fisheye lens, which I knew would distort the vertical lines in the room to create a cool effect. My ISO was set at 640, my aperture f/2.8, and my shutter speed was 1/60. I think that the timeless quality of black and white lends itself extremely well to lifestyle photography (although I do enjoy using colour too) and so the first thing I did in Lightroom 4 was convert the image to b&w to see if I preferred it that way. I then reduced the temperature and tint a little, and increased the contrast, clarity, and sharpening. I also really decreased the highlights and finally used a preset brushstroke from Pretty Presets for Lightroom called Gradual Cool Haze, which I applied to the darker areas of the room. Pictured above is ‘Lifestyle’. ‘Lifestyle’ on a snowy Sunday in February. Life slows down a bit for us on the weekends. It wasn’t always this way, but something we set out to accomplish a couple of years back and something we exceeded at doing. We still have a bit of craziness that lingers. Libby had FIVE super fun shows to perform this weekend between Friday night and Saturday night, and we had a BIG 49th birthday in the house to celebrate, but over all, I like to think we move at a slightly slower pace than we use to. We really try our hardest to soak up all the family time we can get on these weekend days. I mean, how could we not? With a foot of fresh snow yesterday and some new saucers, we had a date at Shakespeare Hill for some family sledding followed by hot cocoa at the juice bar. Oh my goodness, how I cherish these moments with the kids! We have so much FUN!!!! I shot this photo with my Canon DSLR using the 35 mm 2.0 lens. My ISO was set at 400, with some winter natural light flowing through the window, and my shutter speed was 1/125. 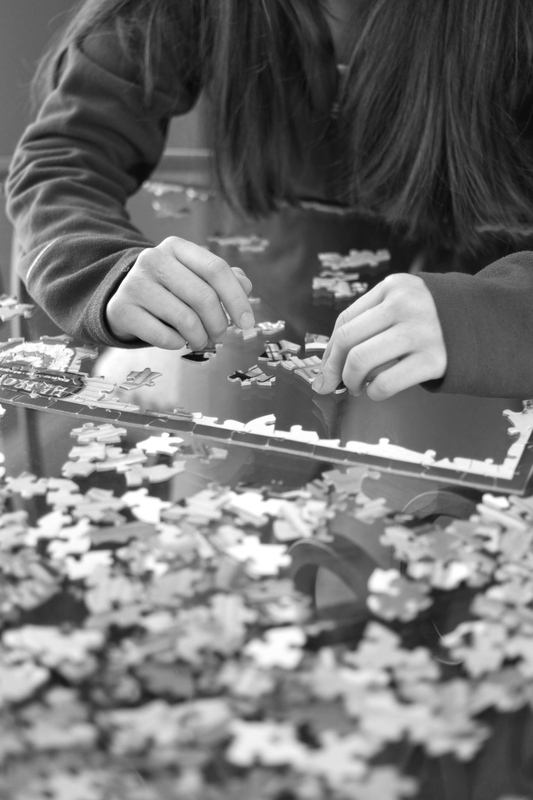 To achieve the ‘creamy bokeh’ of the puzzle pieces , I opened up my aperture wide to 2.0 and focused on Libby’s fingers. The editing was done in lightroom, where I increased the temp and clarity a tad, and converted the photo to black and white.